It has been a long, long road! 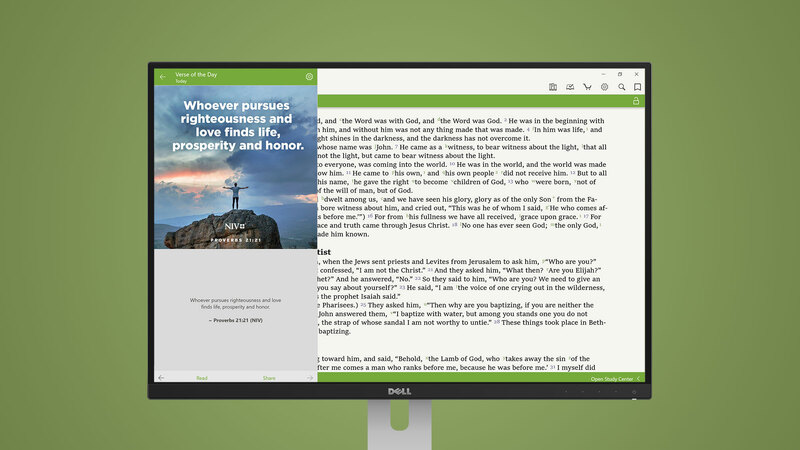 We are so happy to announce a major update for the Olive Tree Bible App for Windows. If you’re one of our Windows users—thanks for sticking with us! It took a lot of work to get this app to match our iOS, Android, and Kindle apps. The day is finally here. If you’re ready, you can get it here. Also, just a heads up: when you download the app from the Microsoft store, you’ll need Windows 10 and you’ll have to sync/re-download your purchases. Then you can remove the old app from your device if you wish. 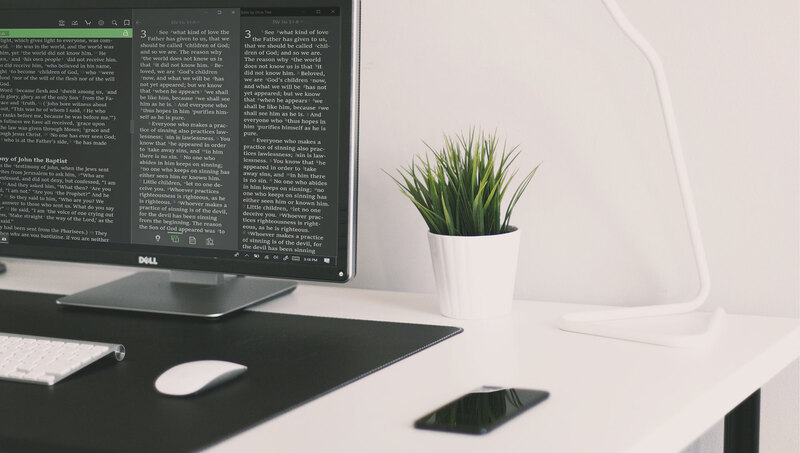 Our support team put together an article on how to download your resources for Windows here. We love using this feature to get us into God’s Word for the day. Tap “Read” at the bottom to dig deeper into the passage. In Summer of 2018, we built audio into the app! 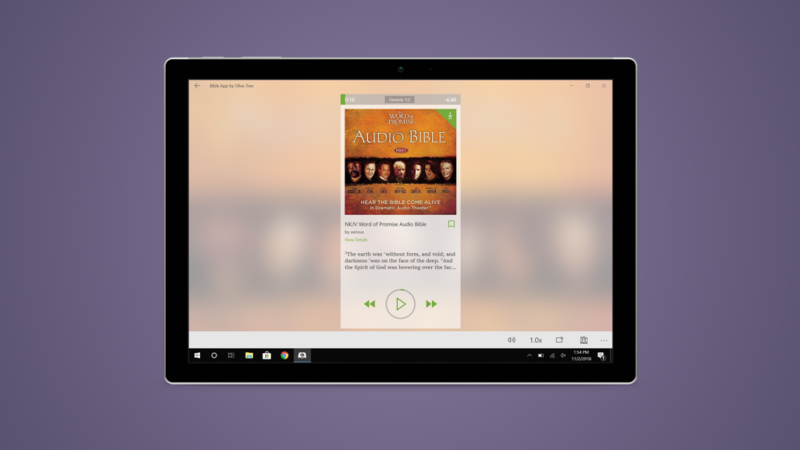 Now you can access all your favorite audio books and Bibles on the Windows platform. If you want to know more details about the audio feature, we have a blog post on that. Now, you have the latest version of reading plans! We made huge adjustments in the Fall of 2018. You can quickly see your progress in this beautiful layout. 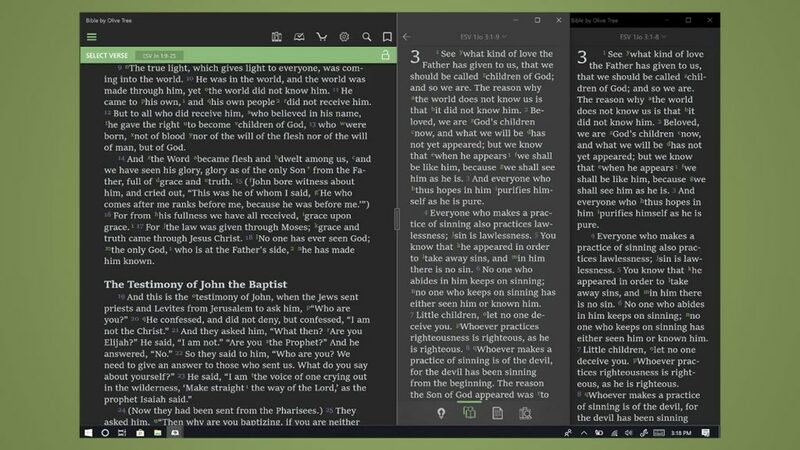 Also, you can use popular devotionals in the reading plan layout. 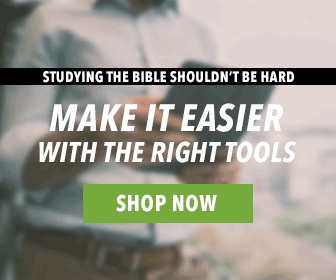 Look under the features tab when viewing a devotional on our store to see if it works in this way. So, start a new reading goal! If you’re using the app on Windows-supported tablet, you can use a pen to highlight! You’re the only platform with this feature, so take advantage of it! 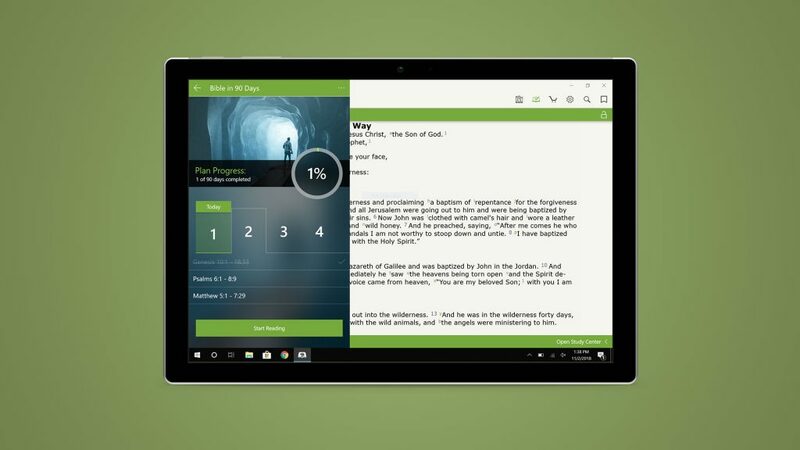 This is a really fun perk of the Windows version of the Olive Tree Bible App. You can drag pop-up windows into already-opened windows to get a better view. Just click and drag. If you get the Study Center out of sync with the main window—have no fear. You can tap on this fancy link button in the bottom-right corner… and SHAZAM! The Study Center will sync back up. So much easier than scrolling. Lastly, we added a dark mode! And, don’t forget that you can also open multiple windows on desktop versions of the app. It makes in-depth studying so much easier! I would love to see rich text capability for notes. I too would like to see rich text capability, especially on the iPad version. As for the rest; we have waited an age and what do we get! I will not be installing the Windows version until I get an assurance that future versions will not require a fresh download of all my books. Thanks for making my bible study time so much more enjoyable! I like it, but on both PC’s it crashes on the purchased books page. Good Grief, no mention that you have remove the old version first, so it’s not an “update” it’s a new install. Microsoft store is terrible as well. Crashed first time it opened, crashed 2nd time opened after login with credentials during sync. Third time appears to be working so far. Also, just to clarify, you don’t have to remove the old version before downloading the new version. I went to the Microsoft Store to get the product and after the install it was the same app that I had before. I went back to double check and the only Olive Tree Bible app available says it was released 9/12/2017. So far this is underwhelming. The release date isn’t accurate. That is the day we first started looking into the Microsoft Store options. If your app doesn’t look like the screenshots above, then you have opened the old app, not the new one. If you haven’t used our Windows app before, and you’re commenting on how this looks the same as the iOS and Android app—you’re correct. However, the Windows app didn’t look like this previously. It was very different from the iOS and Android apps. My app looks nothing like the screenshots and the version in the Microsoft Store is version 6 and the Store tells me that I already have the app installed. When I search the store, the version 6 app is the only one found. We don’t have the older version in the Microsoft Store. Sorry, Steve! Sounds like you are opening up the old one somehow. If you need additional help, feel free to email support@olivetree.com. They can point you in the right direction if you give them the details. I agree with Stephen–very disappointed that this is a new install that leaves my old version in place and then apparently requires me to go through and re-download all of my resources. Hey, Carl! Yeah, the extra steps can be overwhelming if you weren’t prepared for them! But that was the only way for us to get this new app out there for you guys. If you have questions about how to get things set up, you can always email support@olivetree.com, and they can get you going in the right direction. I’d love to use the update, but after download from the Microsoft storre, it won’t load… the green Olivetree window comes up and then crashes. After installing the new version upon running it would show the green OT screen but crash immediately. Hey, Micah! If you’re experiencing a repeated crash, please email support@olivetree.com. They will be able to look into it. Thanks! When I download all my books again will I lose my notes and highlights? I updated through Windows but only 3 or so books showed up and I have dozens. What is the proper procedure to update? Hey, Richard! There are links at the top of the blog for this. Look for info on sync and downloading purchases. Thanks! I think my problem is when I use the Microsoft link on this page for the update it installs a new app separate from my desktop version. My desktop version is still 6.1 and not version 7. Any chance the desktop version will get an upgrade or is that going to get phased out? That’s what I use now. I guess what I’m asking is that Windows programs can be installed through the Windows Store, which work either in Tablet Mode or Desktop Mode, and those that get installed by downloading outside the Windows Store and work only in desktop mode. Olive Tree has traditionally had both versions (with the downloaded one substantially superior IMO. The one that was updated was the Windows Store version. Does that mean there will no longer be the version that is downloaded from the website? Or will it remain yet be not upgraded? Or will it be totally phased out. All further updates will be done through the Microsoft store. Am to extend my gratitude for you, am grateful for the opportunity given to me to comment on the desktop version is great I recommend to you James. Is it right that the app is not available in the Dutch Microsoft Store? Yes, that is true. So sorry Leonard. We are still waiting for permission to list our apps in the EU stores. We really want this fixed soon! Sorry, just saw the post above the one I just made and couldn’t work out how to remove mine. Can someone give an update on the blog some time about the status perhaps? Even just a rough suggestion as to when it may become available would be worth it. Thanks for the response. I appreciate what you are saying, but the lack of information for European customers is very frustrating and someone within your legal department must have a timeframe in mind. Whilst the details may not be known to you as of yet, it would be great if you could ask them to give an update. Yeh..I queried this with the support desk a few weeks back now. Very prompt in replying but merely repeating what Cierra wrote above. Don’t understand why it’s taking them so long as their competitors don’t appear to have had any problems. I did query whether Olive Tree were going to ditch their European market as it’s been nearly a year now but they assured me they wanted to remain ‘live’ over this side of the great watery divide. Otherwise, I’ll have to switch to e-sword or perhaps the more expensive Accordance or Logos where there are no availability problems. I hope their Mac version is getting equal amount of attention as well! Not available in Windows Store for me in Germany. I’d like to be able to create custom collections, instead of only having “favorites”. It is very disappointing that you didn’t mention in your Newsletter that the App is not available in Europe. It would have saved me some time if I had known this before trying to get the App! I’m afraid this ‘launch’ feels quite disappointing for Europeans. I have wasted a lot of time trying to obtain the update until I had to come onto this thread to find it unavailable! I am sure it’ll be great when it comes – but a global email saying it is available when it is NOT available to all on your email list is very disappointing. It will be helpful if you send an email to your European users to let us know when it is available so we don’t have to waste more time having to keep checking the Wondows Store. Olive Tree are taking ages to sort out their GDPR compliance. Is this what is causing the unavailability of the new version on WIndows? Seems a shame as it is diverting many new users to other apps like Logos. Once on another system, people are unlikely to return to try Olive Tree I think. The Windows Store on my machine says ‘Bible by Olive Tree is currently not available’. No reason, no anticipated date. Please can someone give us a date for resolving this? I can’t think of any other software supplier that hasn’t sorted its GDPR status 10 months on from the implementation date last May. But maybe this isn’t the cause. I’d value some clarification. Yes, just noted to another poster that I picked this up some weeks ago. Olive tree support desk were very helpful but it’s out of their hands. I really don’t understand the delay seeing as their competitors have not had any problems. GDPR came into force in May last year and there was plenty of time to prep for it. Although Olive Tree deny it, I have suspicions they are not bothered about supplying the software in the EU otherwise they’d have been up and running by now. Shame really. The new Windows version was so easy to setup. I was concerned that I would have to download all my books individually but was pleasantly surprised that the new app downloaded them for me…all I had to do was wait for the sync to complete. I haven’t found the “Close Bible” button like the 6.0 app had for a controlled shutdown. Learning how to manage Notes now. I like the revisions made, looks good. Great work. The new version is great but I miss the ability to choose a update all button when it come to updating the books. Plus with a lot of Windows tablet now available it would be nice to have the parallel book mode be in top and bottom in portrait mode. It’s kind of hard to read the 2 different bibles in a skinny window. This feature is available in the IOS and android so I assume it can be put in the windows version. I was absolutely thrilled when I got the email about a new windows version of your program. Then the huge let down when I tried to download the program and found it is only for win 10. Nothing prior is supported. Are you aware almost 50 % of windows PCs still run win 7. My main computer is such and I have no plans to replace it anytime soon due to the efficiency I get from it. So once again I am left without options and suppose I will now certainly stop any future plans for added purchases, as I begin a search for a new platform and program to use for Bible study and lesson preparation. Same here, Richard. I have quite a few Windows PCs, having worked many years in the industry…all Windows 7. I upgraded a couple to 10 for less than a week before wiping and reinstalling 7. My main PC is ten years old this year, and still going strong. I will not upgrade to Windows 10. I made the leap to Logos last year, and now I’m glad I did. Their newest version runs Windows 7. Will the old version remain active with all my books after I setup the new version? Yes. But once you have the new app set up, you can uninstall the old one if you wish. Still very disappointed that the European users are without any update untill now. Almost a year without news of a reappearance of the app in windows or ios. I got pretty excited there for a moment. It appears this new version is only available to Windows 10 users. Why are you pushing your customers towards competing products that support previous Windows versions? Is Microsoft offering incentives to software developers (directly or indirectly) to assist in their push to force people away from previous Windows versions? FINALLY! I long to see this app to be available on Windows 10. Been using this app is Android and in IOS and is indeed my favorite Bible app. And now I can use it on Windows too. This is really awesome. The best thing is, it can be synchronized in cross operating system platforms. 🙂 THANK YOU Olive Tree!!! One suggestion though, can you make the window on Notes (when you click Add Note) movable? Often times, when you take notes you need to see the passage, but since it blocks the way one will have to close the add note first before checking the passage at the back. So it will be good if the window will be movable. Hey, Vincent! In the Study Center, the third tab over is for notes. If you create a note in the Bible text and it is in the way a bit, like you mentioned, you can open it in there and keep on editing. However, if you start by making a note there, I don’t think it will be tied to the verse. So just be aware of that! Some of us cannot afford a new PC just to get a new version of Windows to load your app. 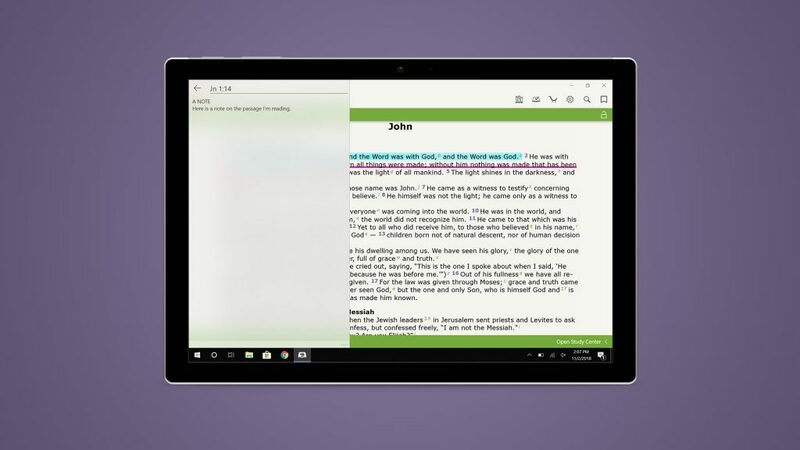 The last thing I want to trust to Microsoft is my Bible and study notes. It appears this will only be available through the “Windows store”. No one is able to second guess the future implications of that and for that reason I will be uninstalling this nice app and going back to my eSword program. Best wishes to Olive Tree! Hurrah! 😊 I’ve been waiting for this for a long time. Too late for my old Windows Phone unfortunately but it might make a Windows tablet viable! To those who are concerned that it won’t work on Windows 7, I understand your concern but unfortunately Windows 7 itself has less than one year of Extended Support (security patches only) from Microsoft left (https://support.microsoft.com/en-us/help/13853/windows-lifecycle-fact-sheet), so it may be worth considering an upgrade. Love the new Windows 10 app, perfect! Thanks! When can we expect to get this in Europe/the UK please? Hey, Paul! We hope to get the app back up in EU app stores soon. We’re doing everything we can! This new app is better than our older version, and brings the app on our Windows platform up to par with our app on Android and iOS. If you have other questions, you can contact support@olivetree.com. Thank you! Support are unable to advise any more clearly than “soon”, I contacted them a few days back. I was however informed by them just over two months ago now that there would be an announcement “soon” so I am not sure what that term actually means at this point. Same as other comments re availability in the UK and Europe. Now nearly a year. Not convinced Olive Tree are serious about make this app available again over here. E-Sword, Accordance, Logos et al have had no problems so I really do not understand the problems. Many of us here knew about the GDPR regs well before they came into force and took steps to ensure our respective companies/organisations complied. Sorry to whinge, but like others, I have bought products in good faith for use on the old version (ie, pre GDPR) but I don’t see any commitment being returned from Olive Tree. What I find even more staggering is that they even allow us to pay using European currency for audio resources that we cannot even use! Quite agree, Matt. The fact that folk like us are complaining would hopefully send a message that there are European users aplenty who want to use their product. Unfortunately, Olive Tree really don’t seem that bothered. Unlike their competitors. I am also very frustrated with the lack of ability to download the software in the UK, despite having received the ‘Don’t Miss Out on the New Windows App Update!’ email. I had not appreciated until I looked at all the comments above as to how long this issue has been taking to resolve. The Android app works well but a desktop version is really need for making notes. Whilst I appreciate the comments from some users about moving to other software, this is not a reasonable solution as over the years I have purchased a number of resources and I want to be able to use these all in one app – not spread across different apps. An update as to when we can expect to be able to download the app would be really appreciated as it will allay any fears the European users have that they have been abandoned. I understand what you mean about the investment you have already made. I am in a fortunate enough position to be able to afford to buy Accordance this last week for my ipad as I cannot use Olivetree on it, but this has cost me a decent whack to have BDAG, NA28 and a couple of others on it. In other words, I have had to pay close to over £150 to have bible software fit for purpose on my laptop, with some of the same resources as I have on Olivetree. Yep, I have downloaded Accordance now as they had an offer on their basic package of $25. Sad thing is we want to use the Olive Tree app but despite mine and others emails and comments I see the service desk have stopped responding. No doubt they have nothing to add but the silence from senior executives is a bit telling at the moment.